The asteroids are expected to zip past our home planet within twenty minutes of each other, early on Tuesday morning (November 20). The first of the space rocks, dubbed by NASA Asteroid 2018 VQ6, will reach its closest distance to Earth around 7.29am GMT (UTC). NASA believes the second space rock, Asteroid 2018 VP7, will appear shortly after around 7.49am GMT. Neither of the asteroids will clip the Earth tomorrow but both are large enough for NASA to keep a watchful eye on them. Asteroid experts at NASA’s Jet Propulsion Laboratory (JPL) in California estimate both asteroids could measure between 39.37ft and 114.8ft (12m to 35m). Asteroid VQ6 is the bigger of the two, measuring an estimated 52.49ft to 114.ft (16m to 35m) in diameter. The space rock is an Apollo-type asteroid with a perihelion, or nearest orbital point to the Sun, similar to Asteroid 1862 Apollo. VQ6 will reach its closest possible distance to Earth tomorrow of around 0.02931 astronomical units (au) or 11.40 Lunar Distances (LD). One astronomical unit equals about 92.95 million miles (149.59 million km), which is the distance from Earth to the Sun. Tomorrow, the asteroid will narrow the distance down to just 2.72 million miles (4.38 million km) – an incredibly close encounter on the astronomical scale of distances. The close passage to Earth has earned the asteroid the title of Near Earth Object (NEO). The US space agency explained: “As they orbit the Sun, Near-Earth Objects can occasionally approach close to Earth. NASA defines NEOs as any asteroid or comet on an orbital path around the Sun of around 1.3au or 120.8 million miles (194.47 million km). 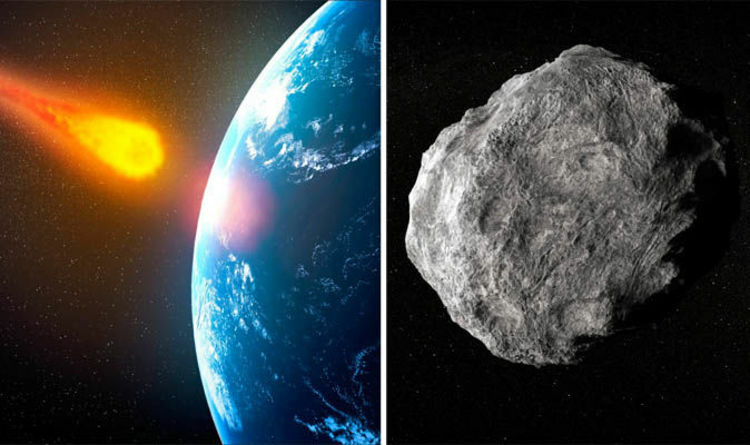 If an NEO is big enough to cause considerable damage upon impact and approaches the Earth too close for comfort, NASA brands it a Potentially Hazardous Asteroid (PHA). The second of the two space rocks, Asteroid VP7, is estimated to measure somewhere between 39.37ft and 91.86ft (12m and 28m) in diameter. The asteroid will reach a so-called nominal distance to Earth of about 0.01961 au which is the equivalent of 7.63-times the distance between the Earth and the Moon. This means the asteroid will fly by tomorrow from a distance of more than 1.82 million miles (2.93 million km). NASA’s JPL then expects Asteroid VP7 to make 16 more Earth Close Approaches between May 3, 2019, and June 28, 2095. The asteroid is flying through space at breakneck speeds of about 2,236.9mph or 5.67km per second.